After piecing a Grandmother’s Flower Garden, I craved to start another English Paper Piecing project. I’ve always been fond of Tumbling Blocks pattern but I’ve already made a scrappy one and decided I would make this one in a star layout. I’ve collected batik fabric for a while and have a nice selection. I decided to make Tumbling Stars with two-tone batik stars and black Kona background. This is the project that keeps my hands busy as I watch movies and relax at night. It is currently 1/2 queen size. 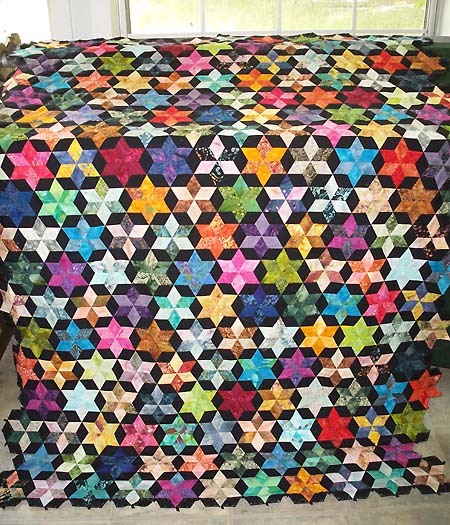 November, 2013: I’ve finished piecing the main body of the quilt and to even up the edges, I’ve begun appliqueing onto a plain black border. Have I ever mentioned how I feel about appliqueing? No? Well, I COMPLETELY AND TOTALLY DISLIKE APPLIQUEING! At this point, one side is done. I’m itching to do something completely different. I have a feeling this top will take a ‘time out’ in the closet before it’s done. Gorgeous! I love the black background….really makes the stars pop! Copyright © http://www.shirlsu.com 2013 - 2019 all rights reserved.